Origin: Indonesia, Pakistan, Sumatra and India. In Asia the Tire Track Eel is not only used as a decorative aquarium fish, but it is also used as a food fish. It is a nocturnal species that should be provided with rocks or logs for hiding places. Be sure to keep a tight lid on top of the aquarium, this jumper will get out through virtually any space. The Tire Track Eel is carnivorous and will eat a variety of insects, worms, and smaller fish. They will also accept dried or frozen foods. The Tire Track Eel is not successfully bred in captivity. This species of spiny eel can eventually grow to be quite large so plan accordingly. That cute little 4 inch fish may eventually grow to over 2 feet long! 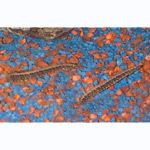 Keep small specimens up to 6 inches in a tank that is at least 36 inches long and about 35 gallons. Larger specimens will needing an even bigger area, tanks that are 48 inches in length or longer and 55 gallons and up will be necessary. Tank should be well planted with floating plants also used. An abundance of hiding places should be provided as this species likes to hide away during the day. Bogwood, rock caves and PVC piping are all suitable for this purpose.